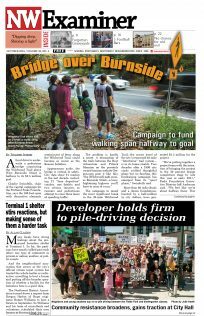 A fund drive to underwrite a pedestrian bridge connecting the Wildwood Trail above West Burnside Street is halfway to its $2.5 million goal. Charlie Swindells, chair of the capital campaign for the Portland Parks Foundation, says the 180-foot-span with decorative elements reminiscent of ferns along the Wildwood Trail could become as iconic as the Benson bubblers. Appearances aside, the bridge is critical to safety. City data show 51 crashes in the last decade, including 21 “lane departure” crashes, one fatality and two serious injuries, as runners and pedestrians attempt to cross three lanes of speeding traffic. The campaign to mend the most significant break in the 30-mile Wildwood Trail—the crown jewel of the city’s renowned 40-mile “Intertwine” trail system—is in its home stretch. Two decades after a 1996 city study yielded thoughtful plans but no funding, this fundraising campaign has emerged from its “quiet phase,” Swindells said. More than 60 individuals and a dozen foundations, boosted by a half-million in city dollars, have generated $1.3 million for the project. Excellence—and safety. Locals and Wildwood Trail users such as Portland State University’s cross country runners are familiar with the Navy SEAL-like challenge presented by the trail’s crossing of a major arterial where cars frequently travel 45 mph around a curve. Runners and pedestrians scramble down the embankment, watch for an opening, and then sprint for it..
Portland Bureau of Transportation accident data for the previous decade (most recent figures available are for 2005 to 2014), said spokesman Dylan Rivera, include two instances in which a car stopped for a pedestrian, only to be rear-ended by another car. “This is a safety issue for everybody,” Anderson said. The Parks Foundation’s January 2015 application for a Metro Nature in Neighborhoods Capital Grant shows government contributions as one-third of the project’s total, then listed at $2.335 million. So Swindells is hosting fundraisers, talking to foundations and hopes to find a major corporate sponsor to match contributions from the city and Metro. The final dollars for the bridge will come from crowdfunding, Anderson and Swindells say. “I’m calling it an icon of Portland’s built and natural environments,” Swindells said. The Parks Foundation hopes to fully fund the bridge during this, its 15th anniversary celebration year. The construction timeline is under two years, a clock that will start ticking when the fabrication of the bridge’s metalwork begins, Anderson said.